Yes, it is true. The Schooner America 2.0 is the venue for the Lowering of the Pirate Wench! 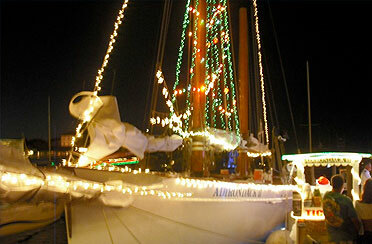 Join us for this most famous Key West tradition and enjoy a New Year’s Eve Bash aboard our boat. Certainly you want to celebrate New Year’s Eve aboard the Schooner America 2.0 for the best seat in the house. Watch the famous Schooner Wharf Bar “Lowering of the Pirate Wench” aboard our yacht. We will hoist the Pirate Wench up to the top of our 80-foot mast aboard the Schooner America 2.0. We will be the leader in the count down to the New Year. Simply cheer with us as the countdown starts and celebrate with love. Enjoy this intimate time with your friends and family on the decks of our classic yacht. Avoid the crowds on the dock for an amazing VIP experience. Sit with us in luxury and join in on the countdown to celebrate the New Year in style. Clearly, this is a Key West tradition that you cannot miss and are sure to get the best photos in the house. Let our most hospitable crew serve you. Sip on Champagne or the beer of your choice and enjoy some Hors d’ Oeuvres. Above all, you must know that this is the most memorable way to celebrate New Year’s Eve in Key West.